Sis and Mae Wine Co.
Sis and Mae Wine Co is inspired by our grandmother, affectionately known as Sis, and her sister-in-law Mae. Each moved their families from New Mexico to Oregon in the late 1940's. While they moved around a bit, based on the availability of work, wherever they were they were fixtures on the porch of Sis' house, gossiping, drinking copious amounts of coffee, and generally looking out for their households. As they raised their families they, without intention, became a part of the Willamette Valley's unique culture as well as had their own small part in defining who we are as Oregonians. The environment from which they took and contributed helped to make our family what it is today. 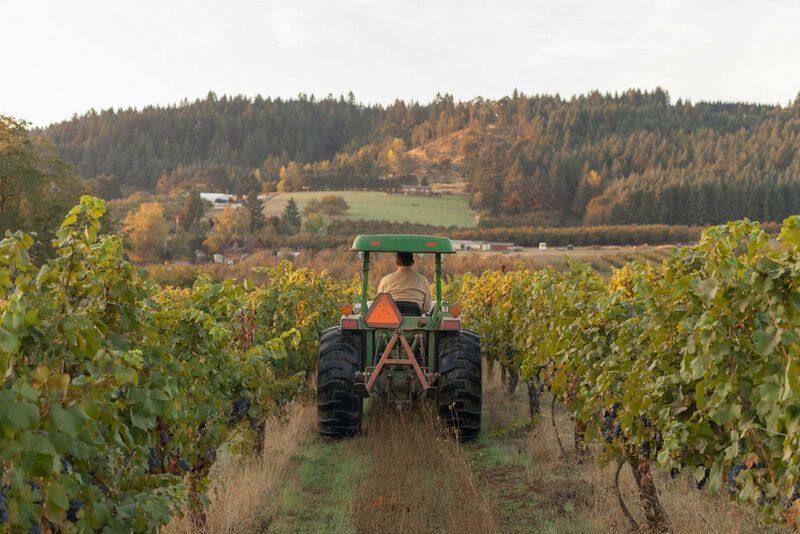 It is in this spirit that we set out with the lofty goal of producing wines that taste of the spirit of Oregon with a sincere hope that they are a part of those moments in which you are connecting with the people and environment around you. To order any of our available wines please send a mail to scott@sisandmaewineco.com or call us at (503) 606-6798. We can ship to most states and will be happy to process your order immediately. We genuinely appreciate your interest and support and look forward to sharing our wines with you. Twice a year we send special shipments of our newest releases to our most ardent fans. You can choose from a 3 bottle, 6 bottle, or 12 bottle shipment. In addition to the occasional joy filled package on your porch you will get other perks, like flat rate shipping, discounts on reorders, invitations to events, etc. Just send me a mail scott@sisandmaewineco.com for more details or to get yourself in the club. Tastings are available by appointment in Portland or down in wine country. Please contact us to inquire and schedule. For up to date information on our releases and special events sign up for our mailing list below! We promise to be infrequent but informative. Sis and Mae Wine Co. is a small wine producer located in Oregon's Willamette Valley. We strive to create wines that are accessible and indicative of Oregon's unique environment, land, and culture. Please join our mailing list below to stay up to date with our release and announcements.